Join us for a reading and talk with National Book Award-winning poet Nikky Finney. 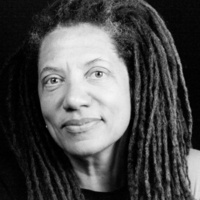 Nikky Finney is the author of the poetry collections Head Off & Split (TriQuarterly Books, 2011), winner of the 2011 National Book Award; The World Is Round (InnerLight Publishing, 2003); Rice (Sister Vision, 1995); and On Wings Made of Gauze (W. Morrow, 1985). She has been a faculty member at Cave Canem summer workshop for African American poets; a founding member of the Affrilachian Poets, a particular place for poets of color in Appalachia; poet and professor for twenty-three years at the University of Kentucky; and visiting professor at Berea and Smith Colleges. She won the PEN American Open Book Award in 1996 and the Elizabeth O'Neill Verner Award for the Arts in South Carolina in 2016. Nikky Finney's work, in book form and video, including her now legendary acceptance speech, is on display in the inaugural exhibition of the African American Museum of History and Culture in Washington, D.C.